Good morning. I am delighted to join you at the opening of the Internet Economy Summit 2018. A very warm welcome to you all, especially to our friends from the Mainland and overseas. We are also privileged to have Dr Akhtar, Under-Secretary-General of the United Nations, joining this year's Summit, which follows hot on the heels of the Asia-Pacific Business Forum hosted in Hong Kong in the last two days. The Forum provided a platform for high-level exchanges on digital technology and its impact on our economies. Later this morning, Dr Akhtar will share with us her insights on the many opportunities and challenges facing us in the international arena. I already have the privilege of having a very constructive discussion with Dr Akhtar yesterday and I am sure you will be inspired on what she is going to share with you. The theme for this year's Summit is "New Impetus for the New Economy". Indeed, the Internet has led the world into the digital era and created a whole new economy as well as countless business opportunities. I was here last week to officiate at the Hong Kong ICT Awards Presentation Ceremony, which celebrates excellence in information and communications technology. I was impressed by the breadth of sectors, industries and businesses represented by the awardees. They embraced everything from entertainment and Fintech to business in general, healthcare, home and lifestyle as well as people and mobility. This shows that the Internet, or innovation and technology (I&T) in general, have already become an integral part of our daily lives. This is already the third edition of the Internet Economy Summit. The first Summit was held in 2016, just a few months after an Innovation and Technology Bureau was created within the HKSAR Government to provide dedicated leadership and co-ordinated effort in this area. Since then, the Government has made significant investments to boost innovation and technology. These included a total of HK$28 billion allocated under the last term of the HKSAR Government. It was a good start, but given the speed of technological evolution, that is clearly not enough. And investment is only one, though an important one measure to achieve our ultimate goal of fostering economic development and improving people's daily lives through wider application of innovation and technology. We must keep reinforcing and upgrading our capability, as well as providing a conducive ecosystem for innovation and technology development in Hong Kong. This is the reason why this term of the Government, which started on July 1 last year, has come up with a more holistic approach to drive innovation and technology in Hong Kong. In my maiden Policy Address last October, I outlined an eight-pronged strategy for Hong Kong to strengthen our competitiveness in the global innovation and technology race, ranging from more resources for R&D and nurturing a talent pool to venture capital and popular science education. We have also highlighted four key technology areas, namely healthcare technologies, artificial intelligence and robotics, smart city and Fintech. I believe these can become new economic drivers for Hong Kong's future development. Our I&T efforts will be given a major boost in the context of the Guangdong-Hong Kong-Macao Bay Area on which a State Council-approved Development Plan will be promulgated soon. This economic blueprint for the nine cities in Guangdong and the two Special Administrative Regions of Hong Kong and Macao, with a population of 68 million and a combined GDP of US$1.5 trillion, will provide enormous opportunities. One of our targets is to develop an international innovation and technology hub in the Bay Area, and Hong Kong will play a key role in it. Together with the planned Hong Kong-Shenzhen Innovation and Technology Park at the Lok Ma Chau Loop, Hong Kong, Shenzhen and cities in the Bay Area can complement one another and create our version of Silicon Valley. To realise our vision, we have put together a comprehensive package of long- and medium-term initiatives as well as immediate support measures for relevant industries. 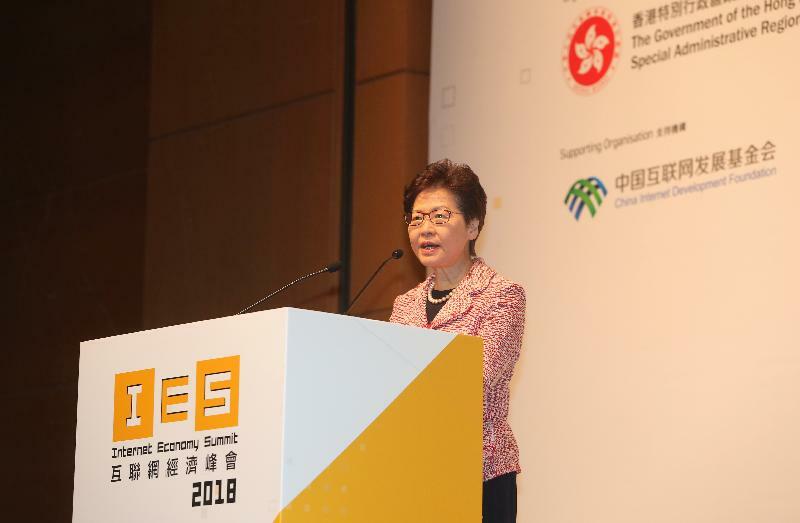 I have set a goal to double Hong Kong's R&D expenditure as a ratio to the Gross Domestic Product to 1.5 per cent by 2022 - or about HK$45 billion a year. To help achieve this, we will for the first time in Hong Kong provide super tax deduction of up to 300 per cent for R&D expenditure incurred by enterprises. On talent development, we are launching a HK$500 million Technology Talent Scheme, which includes the establishment of a Post-doctoral Hub and a dedicated Re-industrialisation and Technology Training Programme to subsidise local companies to train their staff in advanced technologies, especially in Industry 4.0. These will be rolled out by the third quarter of this year. Our goal is to encourage more young people to engage in R&D and technology entrepreneurship as a long-term, life-long career. I was therefore very pleased to hear from Nick (the Secretary for Innovation and Technology, Mr Nicholas W Yang) that we will have a separate programme for young people tomorrow. In addition, we will provide studentships for local students to pursue research postgraduate programmes in our publicly funded universities. At the same time, we aim to attract the best talents from the Mainland and overseas to enrich Hong Kong's ecosystem. In order to attract the world's top scientific research institutions and technology enterprises to Hong Kong, we have earmarked HK$10 billion to support the establishment of two research clusters in Hong Kong: one on healthcare technologies and the other on artificial intelligence and robotics technologies. We aim to achieve a win-win result by attracting the best scientific and innovation brains from around the world to join forces with our local research talents. I should point out that the above-mentioned HK$10 billion is just part of the HK$50 billion funding committed by the Financial Secretary in his Budget Speech delivered in February this year to support innovation and technology development in Hong Kong. Other initiatives include allocating HK$7 billion to the Science Park to boost support for its tenants and set up a Smart Campus. Cyberport will also receive HK$200 million to enhance support for its start-ups. In adopting new technology, the Smart City Blueprint for Hong Kong published last December provides a clear roadmap for making use of technologies to drive economic growth and enhance the quality of living in our city. Pivotal to this no doubt is the application of information and communications technology, in particular big data analytics, cloud computing and Internet of Things to take advantage of the ever-increasingly connected Internet-driven economy. We will invest more than HK$900 million in the next few years to implement several smart city infrastructure projects, including the provision of e-ID to all residents, and launching a multi-function smart lamppost pilot scheme. The success of all these programmes and initiatives requires strong leadership and sustained investment well into the future. Within the Government, the high-level Steering Committee on Innovation and Technology, which I personally chair, will provide the steer and co-ordination needed at the highest level to implement our innovation and technology agenda. 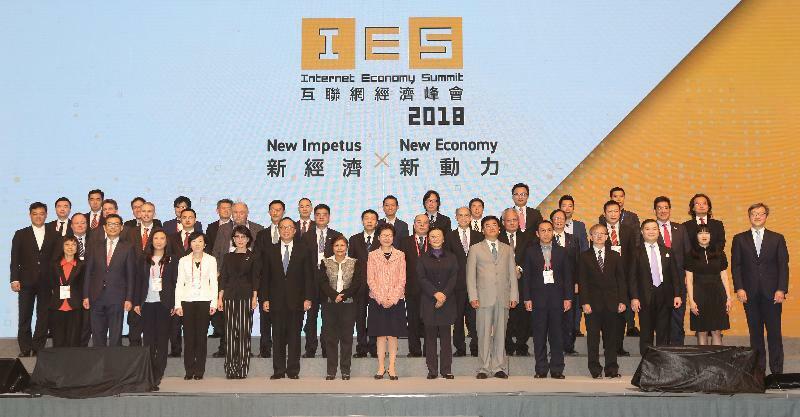 With the support of industries and the community at large, as well as our partners in the Mainland and around the world, I look forward to sharing with you the results and achievements on different fronts at next year's Internet Economy Summit. Before closing, let me thank President Ma from the Chinese Internet Development Foundation and the Cyberspace Administration of China for their unfailing support of this annual flagship event. I wish you all a very rewarding Internet Economy Summit and our visitors a memorable stay in Hong Kong. Thank you very much.